Congratulations to Dr. Ilke Arslan, Pacific Northwest National Laboratory, on joining the editorial board for Microscopy & Microanalysis. The journal provides original research articles on imaging and compositional analysis to biologists, materials scientists, and others interested in microscopy. The international publication is the official journal of the Microscopy Society of America and eight other societies, including the European Microbeam Analysis Society and the Australian Microscopy and Microanalysis Society. It is also affiliated with South African and German societies. As a member of the 18-person board, Arslan will assist in the review of manuscripts, help select the best manuscripts from the journal for the annual award and for inclusion on the journal's website. She will also attend editorial board meetings and provide assistance, as requested, with editing a special issue or writing a review article. 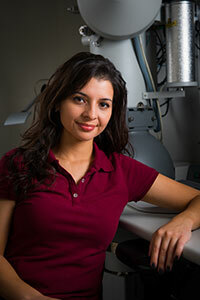 Arslan is well known for bringing her physics expertise to chemical imaging and catalysis, working on PNNL's Chemical Imaging Initiative and Institute for Integrated Catalysis. A talented speaker, she recently lectured at the National Academy of Sciences' Kavli Frontiers of Science symposium and is a Microscopy Society of America tour speaker. She has received the Presidential Early Career Award for Scientists and Engineers (PECASE) and the research fellowships from the Royal Society USA and the National Science Foundation.